Erica Policarpio, 26, a street vendor at the Quiapo Church offer stones that promised invisibility and protection from bullets. She inherited her space from her father, a faith healer, who learned the trade from a Mangyan family in Oriental Mindoro. Street vendors may have the answer of the campaign of Philippine National Police (PNP) Oplan Tokhang. 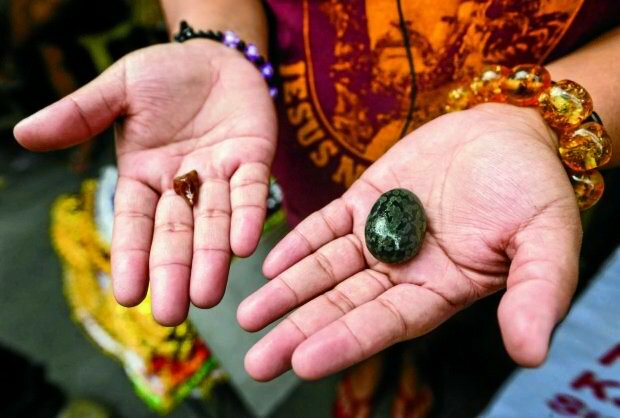 According to the vendor, increasingly men have seeking stones called ‘niyog na bato,” or stone pellets, of “ngipin ng kidlat,” or teeth of thunder. But Love potion or gayuma remains the best-seller. The men asked the vendor if buying ngipin ng kidlat guaranteed invisibility from policemen. According to Policarpio, the stones were all source from a mystical seventh mountain in Bulalacao town. “We refuse customers who specifically ask us for stones that can help them evade Tokhang because we know they’re going to use them for evil deeds,” she said.